Google joins the Hungarian government of Viktor Orban and its allies in funding the company that runs Origo, a Hungarian pro-government news portal. 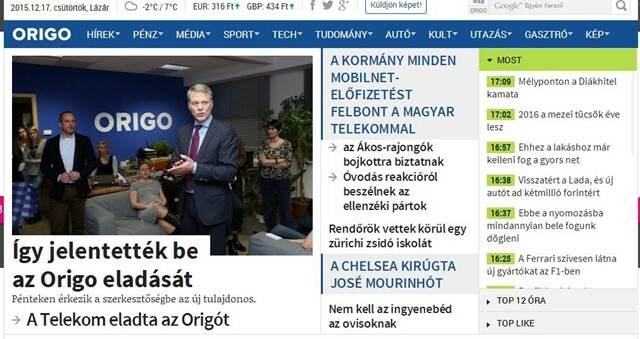 How Origo, a website staffed by pro-government flunkies, will help Hungarian journalism ‘thrive’ is hard to imagine. Origo was created in the 1990s by Magyar Telekom, Hungary’s formerly state-owned telecoms company. In 2005, Deutsche Telekom, the German telecommunications powerhouse, bought a majority stake in the company. Initially, Origo was positioned as a marketing portal with a mission to boost the number of the telco’s internet service subscriptions. At a later stage, the website began to produce journalistic content and, in time, it became known for its investigations into the Orban government and its allies. However, Origo started to temper its coverage after 2013 at the request of its owner, Magyar Telekom, which had to bow and scrape to the government as it needed to renew its telecom license, a decision that is made by local state-appointed regulators. However, the website’s journalists continued their valiant investigations, which in June 2014 led to the sacking of Gergo Saling, the portal’s editor-in-chief. Many more journalists followed, quitting the portal in protest. As the website became a PR burden for Deutsche Telekom, the Germans scrambled to get rid of it. They sold it in 2015 to New Wave Media Group for €13.2m, cash raised from the state and from banks known to be supportive of the government. Such financing schemes have become a pattern used by Orban’s oligarchs during the past five years or so to take over news media in Hungary. The owner of New Wave Media Group was Istvan Szaraz, a controversial businessman who received millions of euros from the Hungarian National Bank (MNB). In 2017, Adam Matolcsy, son of MNB’s governor Gyorgy Matolcsy, bought the full stake in the group. The company has since significantly expanded its media portfolio and further cemented its relations with the government. Today, it owns ten web portals, blogging and video platforms, and a weather forecast website. In spring 2016, it bought the rights to operate the internet assets run by MTVA, Hungary’s state media corporation that operates more or less as a government department. According to local researchers, the MTVA digital platforms reach some 1.5 million users combined. Origo, though, remains the group’s crown jewel. It is the eighth most popular portal in Hungary, according to data from SimilarWeb, an analytics company. Only large players like Facebook, YouTube and Instagram, and one Hungarian website, Index.hu, get higher traffic. The website has been showered with government cash for the past four years. Origo’s government advertising revenue more than tripled since 2015. Journalists in Hungary interviewed for this article believe that Google’s award to Origo was an accident. “Most probably they didn’t realize who this company is,” said a journalist who used to work with Origo before it was taken by Orban’s underlings. The DNI Fund Council that oversees the Google fund consists of esteemed experts including Veit Dengler, board member at Bauer Media, a German publisher, Bruno Patino of the Sciences-PO Journalism School in France, and Bartosz Hojka, CEO of Agora, a major publisher in Poland. Google did not reply to MediaPowerMonitor’s questions about their decision. Since 2015, Google’s DNI has disbursed some €150m to media outlets and projects across Europe over six rounds of grant-making cycles. The last one, in which Origo’s owner was selected, has ended earlier this month. The grants ranged between €50,000 (for prototype projects) and €1m or more. Google wouldn’t say whether it will continue the program. Critics say that DNI is just a PR program rolled out by Google to appease media and journalists for the damage that the technology giant has inflicted on news media by taking control of much of the online advertising market in Europe. It also coincided with a series of brutal sanctions imposed by the European Commission on Google mostly for anti-competitive practices. Since 2017, Google has been fined €8.2bn in total by the EU. Most of the grantees in Google’s DNI are independent news media, including large and small outlets, but also initiatives spawned by individual journalists. The Origo episode will surely be a blot on Google’s escutcheon for years to come. Hungarian government is poised to shut down the Central European University (CEU), George Soros’ key asset in the country. The Hungarian government gobbles up media wherever its citizens live. With the recent expansion into Romania’s media, their control over the electorate is nearing completion.